Several years ago, Trader Joe’s carried a brand of vodka sauce that was just about the best thing I’ve ever tasted. It got me through many, many late-night university study sessions, and facilitated the consumption of way too much pasta over the course of my higher education. This recipe is the grown-up version of that pasta. Vodka, cream, cheese, and tomatoes come together to form a decadent sauce that’s better than the one I used to buy. Best of all, it takes less time to cook this than it does to go to the grocery store. 1. In a food processor, finely mince pancetta and onion together. Transfer to a saute pan and cook over medium heat until golden brown, about 15 to 20 minutes. 2. Add pureed tomatoes and red pepper flakes and simmer on low, partially covered, for 30 minutes. Add vodka and cook 10 more minutes. Slowly add heavy cream and bring back to a simmer. 3. In a large pot, bring salted water to a boil and cook ziti until al dente. Drain, reserving one cup cooking water. 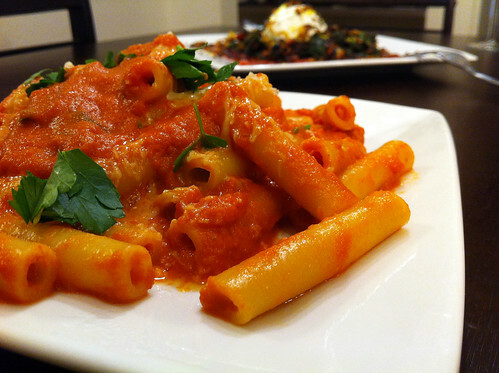 Add ziti to sauce and cook over high heat 2 to 3 minutes, adding a little water if needed. Adjust for salt and pepper and serve with Parmesan cheese.